When the occasion calls for something extra special, reach for these 1.67 Carat t.w. pave Diamond double teardrops. 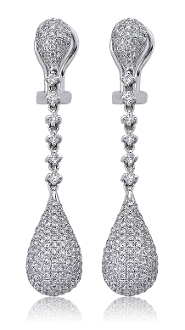 These long and luxuriant drop earrings feature pave and prong-set solitaires totaling an astounding 234 Diamonds from top to bottom; with these on you will never go unnoticed and they evoke elegance and will add a glamorous finishing touch to your ensemble. These earrings dazzle as light bounces through the setting and all is secured with french backs.